Like many other aging academic buildings located throughout the U.S., Dixon Middle School has welcomed several generations of students through its doors. Built in 1931, the school has been renovated over the years to accommodate more students — it is now three times as large as its original structure. But it had issues. 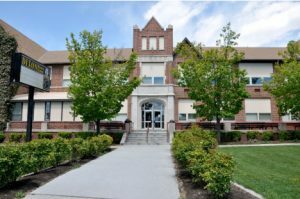 Not only was the school the oldest in the Provo City School District in Utah, it was also considered the dirtiest. Cleaning-related challenges weren’t isolated just to this school, however. The entire school district struggled with uncontrolled cleaning costs, a lack of accountability with custodial staff and schools not getting cleaned. To address these challenges, the district decided to pilot the (OS1) cleaning system. Previous users of the system had found it helped control costs, improve indoor environmental quality and improve the health of the building occupants, so they were eager to give it a try. Before implementing the program, a baseline audit was conducted of more than 1,242 janitorial-related items throughout the school. This included a review of janitorial positions, management programs, purchasing processes and training. The purpose of the audit was to offer a reference point to measure progress. Dixon received an initial audit score of six percent. The auditors found that the school had lacked in most areas related to its cleaning program, including supplies, organization, training and processes used. Custodian job descriptions were insufficient, cleaning tools were broken and dirty, unmarked cleaning bottles littered janitorial closets, dirty mops revealed the same color as the bathroom tile, pipes in the restrooms showed rust and discoloration from the use of improper cleaning chemicals and custodians were generally apathetic. This last point was evidenced by the “countdown to retirement” calendar located in the head custodian’s office. No career track or incentive for advancement in place for janitors. 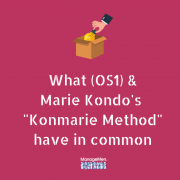 No standardization of products or processes throughout the district—each school operated independently without communication. Hoarding of cleaning tools and supplies. No chain of command or accountability for janitors—the head custodian didn’t know who he reported to. Raises were based on the length of employment rather than performance. 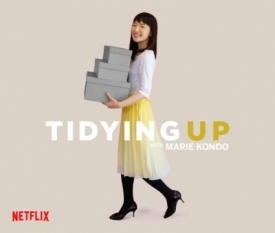 Activity was more reactive than proactive, meaning custodians spent more time responding to the complaints of teachers rather than focusing on improving the general cleanliness of the campus. Custodians had no guidelines for purchasing chemicals, other than what suggestions vendors offered. A year following the implementation of (OS1), a standardized cleaning program, Dixon’s audit score improved from six percent to 80 percent. That score has continued to increase in the years since. The changes have been drastic, including an overall improvement in cleanliness, better morale amongst the teachers and custodial workers, improved health and wellness of building occupants, cost savings and more. Better Health: One teacher who suffered severe migraines causing her to have to call off from work noted that she had not had a migraine or blackout incident since the new cleaning program was implemented (she also switched to use of green cleaning chemicals at home). She cited fewer allergy issues as well. Improved Safety: Where containers of bleach and unlabeled chemical bottles once littered closets throughout the building, the school has transitioned to a new chemical management system. A single locked cabinet holds all the chemicals and supplies used on a daily basis. With thorough training and better controls, this has substantially improved the safety of custodians and students. A Better School: Improving the cleanliness of the school has led to a domino effect throughout the school. Walls were painted to better reflect the cleanliness of the school, teachers became more organized and tidy and students took more pride in their school. Once a major issue, the amount of graffiti at Dixon has virtually been eliminated. Awards: In 2011, Dixon Middle School received the “Best New Program Award” in the K-12 Category of the Green Cleaning Award for Schools & Universities, sponsored by American School & University magazine, the Green Cleaning Network and Healthy Schools Campaign. The Dixon Middle School pilot team is recognized with the Outstanding Cleaning Worker Award. 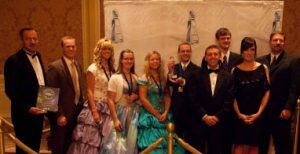 Each of their pilot team members was honored as an Outstanding Cleaning Worker at the 2011 Cleaning Industry Awards Banquet. Reducing Costs: While it’s tough to say exactly just how much the change to (OS1) has saved the school (the school didn’t keep purchasing records and funds were drawn from several different budgets), the new system has reduced the average monthly chemical cost to $80.29, making the chemical cost per cleanable square foot $0.00076. When adding in labor and other costs, the estimated cost to clean per square foot is roughly $.77. This is substantially lower than projected costs from IFMA, which estimate the average cost per square-foot for cleaning educational facilities to be $1.36. Improved Morale: The head custodian said the experience changed his life. 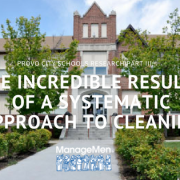 With these incredible results in hand, the Provo City School District made the decision to roll out the program to the rest of its schools. Clean schools are better, higher-performing schools. And when you have data that helps you measure the impact of your cleaning program, including the benefit to teachers, students, administrators and the overall longevity of the building, the decision makes itself. “Compression Thinking” is a distillation of 30 years of research by Robert W. “Doc” Hall, who explains his approach to business in this video. This is a new era, where resources are becoming more scarce and the impact of larger human populations on the Earth requires mankind to rethink business practices, which up to now have been seen as gospel truths. However, proven solutions do exist for business problems, both old and new ones, and Doc Hall explores them here… through his concept of Compression Thinking. The Simon Institute, ManageMen and the (OS1) Users are featured in the video above. Article written for Facility Cleaning Solutions by Ben Walker, ManageMen, Inc.
To improve productivity, set up pantries near or in the restroom, which can be used to safely store consumables. This greatly reduces the amount of paper that workers have to keep on their carts, and minimizes time spent traveling back and forth to restock….